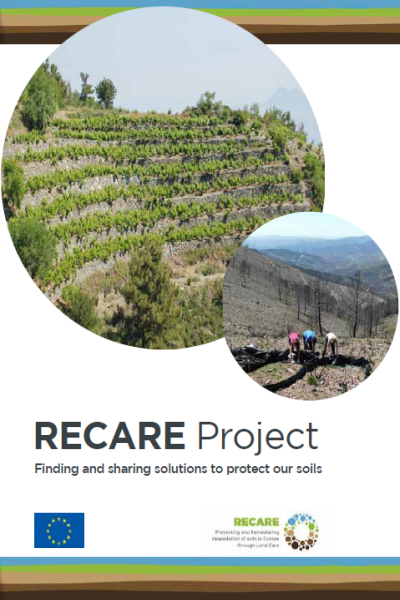 This brochure describes the threats to soils in Europe, how the RECARE project has addressed these, and provides clear examples of soil management options and policy solutions. Ecologic Institute's Ana Frelih-Larsen and Sandra Naumann contributed to the RECARE project brochure, which is available for download. Increasingly, the crucial importance of soils for the well-being of human society is being recognised. In many parts of the world, soil is being lost faster than it forms, and its functions are being lost or diminished, which impacts ecosystem services. In Europe, a number of threats to our soil have been identified in the European Soil Thematic Strategy, these include: soil erosion, salinization, compaction, desertification, floods and landslides, loss of organic matter, contamination, sealing and loss of soil biodiversity. Contemporary soil science has created a suite of practical management responses that address these threats. Mills, Jane and Matt Reed (eds.) 2018: RECARE Project – Finding and sharing solutions to protect our soils. RECARE project brochure.